Frank Zappa: Fact of the matter is, there is no hip world, there is no straight world. There's a world, you see, which has people in it who believe in a variety of different things. Everybody believes in something and everybody, by virtue of the fact that they believe in something, use that something to support their own existence. Fact of the matter is, there is no hip world, there is no straight world. There's a world, you see, which has people in it who believe in a variety of different things. Everybody believes in something and everybody, by virtue of the fact that they believe in something, use that something to support their own existence. 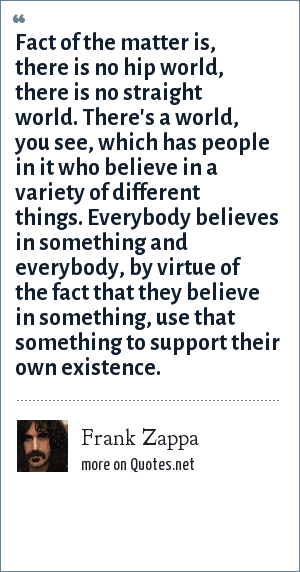 "Frank Zappa Quotes." Quotes.net. STANDS4 LLC, 2019. Web. 23 Apr. 2019. <https://www.quotes.net/quote/19333>.